The official emblem of the Armed Forces of the Slovak Republic. The Armed Forces of the Slovak Republic were divided from Czechoslovak army after dissolution of Czechoslovakia on January 1, 1993. Slovakia joined NATO on 29 March 2004. From 2006 the army transformed into a fully professional organization and compulsory military service was abolished. Slovak armed forces numbered 15,996 uniformed personnel and 3,761 civilians in 2014. Slovak upgraded multirole fighter aircraft MiG-29AS. The Slovak Air Force, officially the Air Force of the Armed Forces of the Slovak Republic, has been defending Slovak airspace since 1939. Slovak Air Force currently comprises one wing of fighters and one wing of utility helicopters, and one SAM brigade. It operates 20 pieces aircraft, as well as 10 helicopters from 3 air bases: Malacky Air Base, Sliač Air Base, Prešov Air Base. The Air Force is currently part of the NATO Integrated Air and Missiles Defense System – NATINADS. MiG-29 Russia multirole MiG-29AS/UBS 12 Aircraft were upgraded in 2008. To be replaced by the F-16 Fighting Falcon. F-16 Fighting Falcon United States multirole F-16V 14 on order Deliveries will begin in 2022. Aero L-39 Czech Republic jet trainer L-39CM/ZAM 7 assigned to the 2nd Squadron. Elbit Skylark Israel UAV I-LEX 5 assigned to the Ministry of Interior and 5th Regiment. The 5th Special Forces Regiment is Slovakia's counter-terrorism and special operations unit. The unit is directly attached to the armed forces general staff, but works for the Operational Reconnaissance Bureau. Slovakia has 169 military personnel deployed in Cyprus for UNFICYP United Nations led peace support operations. Slovakia committed to increase the number of its troops in Afghanistan to around 45 men by the end of 2016. Slovakia has 41 troops deployed in Bosnia and Herzegovina for EUFOR Althea. Slovak troops were withdrawn from Kosovo because the Slovak Armed Forces set its priority to focus mainly on an Afghanistan NATO led mission. Since the independence of Slovakia in 1993, there have been 60 uniformed personnel deaths in the line of service to the United Nations and NATO (as of April 30, 2018). ^ "V armáde SR bude pôsobiť viac vojakov, bude mať aj viac húfnic či BVP". Dnesky.sk. 10 August 2017. Archived from the original on 27 September 2017. Retrieved 15 December 2017. ^ Evolution, Heureka (11 September 2016). "V armáde má pôsobiť viac vojakov aj civilných zamestnancov - Hlavné správy". hlavnespravy.sk. Archived from the original on 15 February 2017. Retrieved 19 March 2017. ^ "Defence Data". Eda.europa.eu. Archived from the original on 2 July 2015. Retrieved 24 December 2014. ^ "National Defence Data 2012 of the EDA participating Member States" (PDF). Eda.europa.eu. Archived (PDF) from the original on 22 September 2017. Retrieved 15 December 2017. ^ ""Slovak Military Budget 2014"" (PDF). Mod.gov.sk. Archived (PDF) from the original on 21 August 2014. Retrieved 15 December 2017. ^ ""Slovak Military Budget 2013"" (PDF). Mosr.sk. Archived (PDF) from the original on 9 October 2016. Retrieved 15 December 2017. ^ "Rezort obrany vyčerpal vlani z rozpočtu 725,6 milióna eur". Topky.sk. Archived from the original on 24 December 2014. Retrieved 24 December 2014. ^ P E R E X , a. s. "Rozpočet armády sa zvyšovať nebude, tvrdí Fico". Pravda.sk. Archived from the original on 24 December 2014. Retrieved 24 December 2014. ^ "Work, Slovakian Defense Minister Review Bilateral Relationship". Defense.gov. Archived from the original on 1 September 2017. Retrieved 15 December 2017. ^ "NATO Update: Seven new members join NATO - 29 March 2004". Nato.int. Archived from the original on 15 March 2014. Retrieved 24 December 2014. ^ "kniha o obrane SR 2013"" (PDF). Lt.justice.gov.sk. Archived from the original (PDF) on 4 October 2013. Retrieved 15 December 2017. ^ "Financial and Economic Data Relating to NATO Defence" (PDF). Nato.int. Archived (PDF) from the original on 5 December 2017. Retrieved 15 December 2017. ^ "Slovenská armáda je v kritickom stave, má to fatálne následky". Komentare.sme.sk. Archived from the original on 24 December 2014. Retrieved 24 December 2014. ^ "Slovenská armáda v číslach: 475 vojakov nebolo na testoch fyzickej spôsobilosti!". Cas.sk. Archived from the original on 24 December 2014. Retrieved 24 December 2014. ^ "Vojakov je menej. Za desať rokov klesol ich počet o 8000". Aktuality.sk. Archived from the original on 24 December 2014. Retrieved 24 December 2014. ^ "Letecká technika Taktického krídla Sliač". lzsliac.mil.sk. Archived from the original on 15 July 2018. Retrieved 7 July 2018. ^ Sputnik. "Russia's MiG hands 12 upgraded fighters over to Slovakia". sputniknews.com. Archived from the original on 15 July 2018. Retrieved 30 December 2018. ^ Kominek, Jiri (13 December 2018). "Slovakia signs for F-16V fighters". IHS Jane's. Archived from the original on 26 December 2018. Retrieved 30 December 2018. ^ "Miliardový nákup v armáde je spečatený". Pravda. 15 December 2018. Archived from the original on 15 December 2018. Retrieved 30 December 2018. ^ "Slovakia completes receipt of C-27J airlifters". Jane's Information Group. 10 April 2018. Archived from the original on 15 June 2018. Retrieved 15 July 2018. ^ "Another 2 UH-60M Black Hawks come into service with the SVK Armed Forces". mosr.sk. Archived from the original on 13 July 2018. Retrieved 7 July 2018. ^ "Slovakia to receive new Bell 429 light utility helicopters". Defence Blog. 1 May 2017. Archived from the original on 1 May 2017. Retrieved 1 May 2017. ^ Jennings, Gareth (2 May 2017). "US approves Bell 429 sale to Slovakia". IHS Jane's 360. Archived from the original on 3 May 2017. Retrieved 3 May 2017. ^ Sliač, 2nd Squadron. "2nd SQN TFW Sliač". 2nd SQN TFW Sliač. Archived from the original on 3 August 2017. Retrieved 30 December 2018. ^ P E R E X , a. s. "Armáda kúpila bezpilotné lietadlá. Snažila sa to tajiť". Pravda.sk. Archived from the original on 15 February 2012. Retrieved 24 December 2014. ^ "Contracts for April 20, 2017". Defense.gov. Archived from the original on 18 September 2017. Retrieved 15 December 2017. ^ "Colt Capitalizes on Foreign Military Sales Program - The Firearm Blog". Thefirearmblog.com. 27 April 2017. Archived from the original on 1 June 2017. Retrieved 15 December 2017. ^ "United Nations Mission´s Summary detailed by Country 2014" (PDF). Un.org. 30 June 2014. Archived (PDF) from the original on 21 March 2016. Retrieved 15 December 2017. ^ ""Pôsobenie Slovenska v zahraničných misiách a operáciách"" (PDF). Cenaa.org. Archived from the original (PDF) on 20 December 2013. Retrieved 15 December 2017. ^ Jasmin. "EUFOR "Exercise Quick Response 2" begins". EUFOR ALTHEA. Archived from the original on 21 December 2013. Retrieved 24 December 2014. ^ "B92 - Info - Slovakia pulling soldiers from Kosovo". B92. Archived from the original on 24 December 2014. Retrieved 24 December 2014. ^ "Účasť Slovenska v mierových operáciách NATO - Slovensko v NATO - Zahraničná politika - Ministerstvo zahraničných vecí a európskych záležitostí Slovenskej republiky". Mzv.sk. Archived from the original on 24 December 2014. Retrieved 24 December 2014. ^ "Two Slovakian Soldiers Killed in Kabul Suicide Car Bomb". Defense News. Archived from the original on 10 January 2014. Retrieved 24 December 2014. ^ "20 Years of U.S. - Slovak Diplomatic Relations". Usembassy.sk. Archived from the original on 5 August 2014. Retrieved 24 December 2014. ^ "Readout of Secretary of Defense Chuck Hagel". defense.gov. Archived from the original on 20 March 2017. Retrieved 19 March 2017. Wikimedia Commons has media related to Military of Slovakia. The Republic of Croatia Armed Forces is the military service of Croatia. The Army of the Czech Republic, also known as the Czech Army or Czech Armed Forces, is the military service responsible for the defence of the Czech Republic in compliance with international obligations and treaties on collective defence. It is also set to support peacekeeping, rescue and humanitarian operations both within the national territory and abroad. Armed Forces consist of the General Staff, the Land Forces, the Air Force and support units. The Hellenic Armed Forces are the combined ground, naval and air forces of Greece. They consist of the Hellenic National Defense General Staff, the Hellenic Army, the Hellenic Navy, and the Hellenic Air Force. The Lithuanian Armed Forces consist of 20,565 active personnel. Conscription was ended in September 2008 but was reintroduced in 2015 because of concerns about the geopolitical environment in light of Russia's military intervention in Ukraine. The Slovenian Armed Forces or Slovenian Army are the armed forces of Slovenia. Since 2003, it is organized as a fully professional standing army. The Commander-in-Chief of the SAF is the President of the Republic of Slovenia, while operational command is in the domain of the Chief of the General Staff of the Slovenian Armed Forces. The Russian Air Force is a branch of the Russian Aerospace Forces, the latter being formed on 1 August 2015 with the merger of the Russian Air Force and the Russian Aerospace Defence Forces. The modern Russian Air Force was originally established on 7 May 1992 following Boris Yeltsin's creation of the Ministry of Defence; however, the Russian Federation's air force can trace its lineage and traditions back to the Imperial Russian Air Service (1912–1917) and the Soviet Air Forces (1918–1991). The Belgian Air Component is the air arm of the Belgian Armed Forces, and until January 2002 it was officially known as the Belgian Air Force. The Belgian military aviation was founded in 1909 and is one of the world's oldest air services. The Slovak Super Liga is the top level football league in Slovakia, currently known as the Fortuna Liga due to a sponsorship arrangement. It was formed in 1993 following the dissolution of Czechoslovakia. The record for most titles is nine, held by Slovan Bratislava, which are title holders. The Spanish Armed Forces are in charge of guaranteeing the sovereignty and independence of Spain, defender of its territorial integrity and the constitutional order, according to the functions entrusted in the Constitution of 1978. These are formations by: the Army, the Air Force, the Spanish Armada, the Royal Guard and the Military Emergency Unit, as well as the so-called Common Corps. Sliač Airport or, historically, Letisko Tri Duby is an international airport in central Slovakia situated between the towns of Zvolen and Banská Bystrica and near the spa town of Sliač. The airport has one runway which is 2,400 m long (18/36). The airport is used by the military as well as commercially for civilian flights. The Slovak Ground Forces, also known as the Slovak Army, is the land specialized service branch of the Slovak Armed Forces. The Slovak Air Force, known since 2002 as the Air Force of the Armed Forces of the Slovak Republic, is the aviation and air defense branch of the Slovak Armed Forces. It operates 28 aircraft and 10 helicopters from 3 air bases: Malacky Air Base, Sliač Air Base, Prešov Air Base. Together with the Czech Air Force, it succeeded the Czechoslovak Air Force in 1993. The Slovak Air Force is part of the NATO Integrated Air and Missiles Defense System – NATINADS. The Latvian Land Forces together with the Latvian National Guard form the land warfare branch of the Latvian National Armed Forces. Since 2007, land forces are organized as a fully professional standing army. Icelandic Air Policing is a NATO operation conducted to patrol Iceland's airspace. As Iceland does not have an air force, in 2006 it requested that its NATO allies periodically deploy fighter aircraft to Keflavik Air Base to provide protection of its airspace. The first deployment of aircraft took place in May 2008. The Common Security and Defence Policy Service Medal, is an international military decoration awarded to individuals, both military and civilian, who have served with CSDP missions. Since the 1990s the European Union has taken a greater role in military missions both in Europe and abroad. These actions were taken under the Common Security and Defence Policy (CSDP), which is implemented by the European Union Military Staff, a department of the EU. To recognize service in these missions the EU authorized the creation of a medal with a common obverse and reverse, to which clasps featuring the missions' name are attached to the ribbon bar. 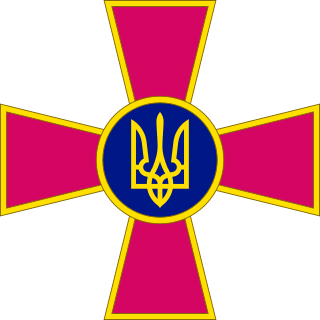 The Armed Forces of Ukraine is the military of Ukraine. They are the principal deterrent force against any aggression that could be shown against the sovereign state of Ukraine. All military and security forces, including the Armed Forces, are under the command of the President of Ukraine, and subject to oversight by a permanent Verkhovna Rada parliamentary commission. The Military Music Band of the Armed Forces of the Slovak Republic is a musical element of the Bratislava Military Command of the Slovak Armed Forces that serves as the primary military band in the Slovak Republic. It accompanies the Honour Guard of the President of the Slovak Republic military and national ceremonies, military oaths, and state funerals, all of which are protocol events. It also represents the military of Slovakia in festive events such as military tattoos and symphonic concerts. On July 1, 2009, it has been under the command of the Bratislava Garrison Headquarters, which was part of the Training Force and Support of the Armed Forces of the Slovak Republic. Exactly 5 years later, the Chief of Staff of the Slovak Ground Forces put the band under it's jurisdiction. The director and commanding officer of the band is currently Major Peter Apolen, who has been serving in this position since 2005.